The Independent Corrupt Practices and Other Related Offences Commission (ICPC) has stated its resolve to work with relevant agencies and stakeholders towards making the 2019 general elections violence-free. This assurance came from the Acting Chairman of ICPC, Dr. Musa Usman Abubakar, while addressing participants at a One-Day Technical Session for The Implementation of National Action Plan (NAP) On Violence-Free Election, with the theme: “Silencing The Guns By 2020” organized by New Partnership for Africa’s Development (NEPAD) in Abuja recently. The workshop brought together various key stake holders to examine the causes and effects of electoral violence in Nigeria and to suggest ways of eliminating it. It also deliberated upon strategies for improving elections management in the country. Dr. Abubakar, who was represented at the occasion by the Director, Public Enlightenment Department and Spokesperson of ICPC, Rasheedat A. Okoduwa, mni, condemned the incidence of violence in Nigeria’s electoral processes. He said, “…violence before, during and after elections, practically denies citizens the right of participation in a free, fair and credible election; and any government that emerges from such process would certainly not serve the people adequately. Abubakar noted that the Corrupt Practices and Other Related Offences Act, 2000, prohibited bribery in relation to voting, and that upon conviction, a penalty of 5 years imprisonment with hard labour awaits offenders. Explaining further, he said ICPC would use its youth friendly and citizen-centred platforms, to campaign against violence, vote buying and other vices in the electoral process. Earlier, in her opening remarks, the National Coordinator and Chief Executive Officer of NEPAD, Dr. Gloria Akobundu, charged participants to be objective in their contributions and come up with solutions that would rescue the country from electoral violence. “Corruption is a recurring decimal in our electoral system, desperate politicians’ quest to grasp power at all costs for selfish reasons, and such unwholesome practices, raise legitimacy problem for leaders who emerge through electoral violence,” she said. 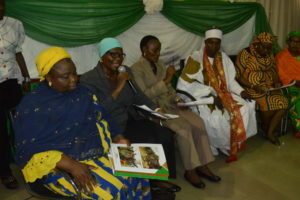 Also speaking at the event, the Secretary to the Government of the Federation, Mr. Boss Mustapha, represented by Dr. Stella Maduka, observed that the occasion was a brainstorming session in continuation of an earlier sensitization workshop held in the month of June 2018, aimed at developing a roadmap for the implementation of suggestions or decisions reached at that earlier workshop. NEPAD is a socio-economic development programme adopted by some of the then member countries of Organisation of African Unity (OAU), now African Union (AU), at Lusaka, Zambia in July, 2001, to which Nigeria under former President Olusegun Obasanjo, was a signatory. Some of the stake holders present at the event include: representative of the diplomatic corps, civil society groups, political parties, youth associations, the media etc.